Everyone has made at least one impulsive purchase in his or her life. Pet shops and women’s clothing stores thrive on such buys. But not many of us would be tempted to buy an entire zoo on impulse. Ah, but in the movies there are no limits as to what can happen. 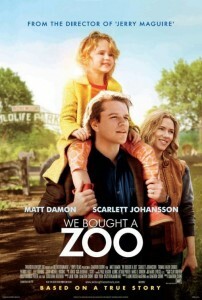 In the film, We Bought a Zoo, based on a true story, such an impulsive purchase forms the storyline for this movie. Matt Damon plays a convincing role as Benjamin Mee, a Los Angeles newspaper columnist, raising a 14-year old son Dylan (Colin Ford), and 7-year old daughter Rosie (Maggie Elizabeth Jones), after the death of his beloved wife. Grief can do funny things to a man trying to fill the void left by his kid’s mom. Given that Dylan is internalizing his pain and externalizing bad behavior, he gets himself kicked out of school. Add in the wild parties at the neighbor’s house plus Benjamin’s grief and his restless nature, and he is ready to get out of the city and start over. Naturally, a place in the country with rolling hills seems just the place to revive, recover and begin again. Never mind that the house of his dreams has a zoo attached. All the better because now rather than just a retreat, it becomes an adventure. As far-fetched as the plot seems, it is based on the real-life of British writer, Benjamin Mee who was also a widower raising two children while owning a zoo. The plot centers on the formidable task of fixing up the dilapidated zoo in time to pass inspection for opening season with the help of a motley staff. The head caretaker is the pretty but businesslike Kelly, played by Scarlett Johansson. She develops an obvious crush on Benjamin but she must complete with his still-fresh wounds of losing his wife. Dylan develops a love interest with Kelly’s homeschooled niece who helps work at the zoo. It’s puppy love but be aware. Most parents of young teens typically prefer their kids not to be worrying about romance quite yet. There is an illusion to an after life but it’s not ever presented in a theological way—no prayers or talk of God–but rather in a spiritual sense of still being connected in some way. Grief, a pained father/son relationship, and a dying tiger, mixes with humor, love and the challenge of rescuing a zoo. Hard work, perseverance and respect are modeled. The story is predictable, but you would be disappointed if it wasn’t. The suspense is always mild so it’s a movie to enjoy and relax by. The Lord’s name is taken in vain and there are instances of cussing. The Motion Picture Association of America gave it a PG rating—parental guidance suggested. The Blue-ray and DVD are available on April 3.